Over time several new features and improvements have been implemented. Here you can find an overview of the most important changes. The application has a new cleaner look with better support for newer computers with HiDPI (High Dots Per Inch) displays, also known by Apple's "Retina Display". RoboMind and RoboMindAcademy are free for quite some time already. This version finally removes the need for a license file. Under the hood, RoboMind now uses the latest Java 11. This results in a faster, and more secure experience. Change the looks of Robo to your likings. 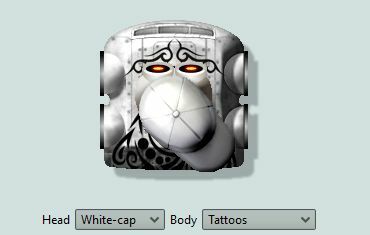 Via the > Settings > View screen you can change the head and body of the robot. Listen to Robo beeping and buzzing as he's moving around the environment. You can turn the sound on/off in the menu bar, or disable it entirely in the settings menu. Pro-tip: try customizing the sounds by adding your own sound theme. Have a look RoboMind's installation folder: /sfx/themes. 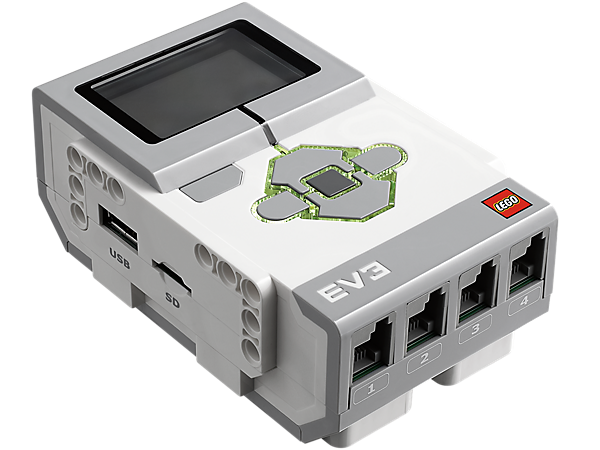 You can now make your RoboMind scripts work on Lego's EV3 by following these instructions. Generate an infinite amount of unique maps straight from a convenient menu. Robo will find its way to the location x=5 and y=3 without bumping. It returns the number of tiles travelled (e.g. try show(goto(5,3))). Tip 1: use [F9] to show grid coordinates. 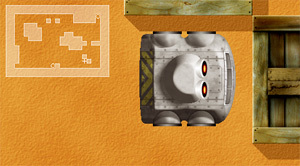 Tip 2: When you opened the remote control, hit the middle mouse button somewhere in the map, and Robo goes to the indicate place (if it is possible). Export maps as 3D collada models that can be opened in Google Sketchup (via > [Map] Save as...). If you have access to a 3D printer you can now use models that are generated by your RoboMind scripts! 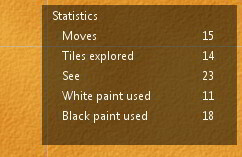 You can choose to export the walls, white or black paint of a map. Export RoboMind scripts to Sparki (via > Export). 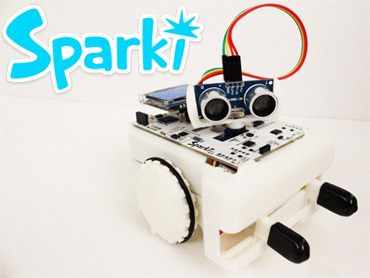 Sparki is an affordable, easy to use Arduino based robot kit. 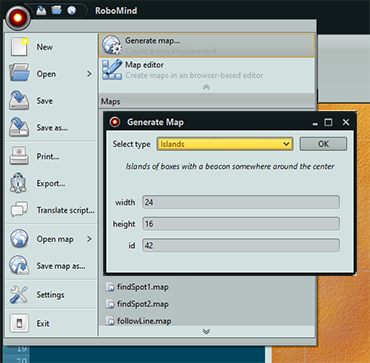 The browser-based map editor is now also included in RoboMind and can be used offline. 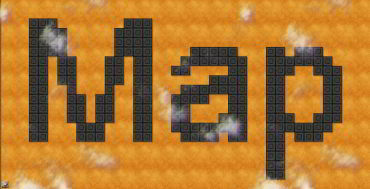 Generate maps with walls to form a text of your choice. Start you script with: #map:text(Hi there!) and see what happens! The frontIsClear, leftIsClear, rightIsClear commands now not only tell you if an adjacent location is empty, but even how many cells are clear in that direction. The frontIsWhite, frontIsBlack, ... sensors are also retrofitted to tell you not only if, but how many adjecent cells have that color. RoboMind now speaks Japanese (Hiragana) thanks to Junichi Ito! It is easier to solve problems in your script thanks to the new debugging tools. When hovering the line numbers when execution is paused, it shows the procedures being called and the values of all variables. RoboMind now speaks Bengali (Bangla) thanks to Arnab Chakraborty! 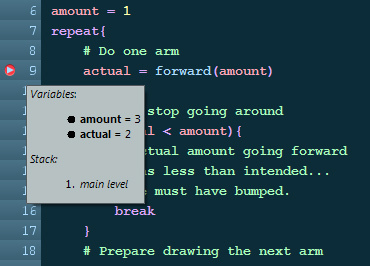 Due to popular demand, the RoboMind scripting language now lets you define variables. Where you first were pushed to come up with smart tricks to remember state by changing the environment, you may now store values like a seasoned hacker does. Take a look at the documentation for more info. With variables and arithmetic introduced, it makes sense to start returning values in procedures. That means you can define your own functions. By default a procedure returns zero, but you can explicitly return a desired value. 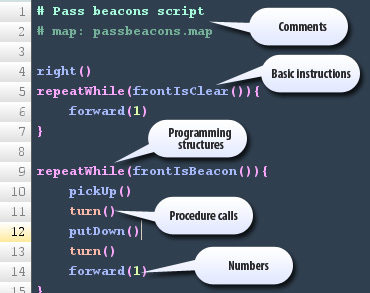 All basic commands (such as forward, pickUp, ...) now return a "success" value as well. So how many squares the robot actually moved (until it bumped), or if a pickUp succeeded. You don't have to watch the use of upper/lower case characters anymore. 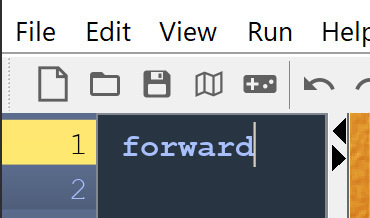 For compatibility with the online RoboMind Academy (and therefore mobile devices with unhandy keyboards), you can now write "Forward", "FORWARD", "forward", etc. To make simple programs even simpler, basic commands now have default arguments (in case they have any). Also, writing empty brackets "()" is not needed since versio 3.0. 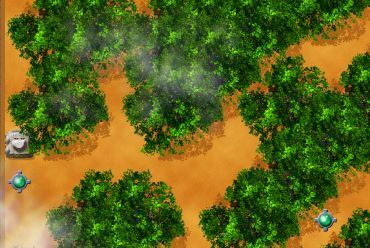 Generate an infinite amount of forest worlds. Start you script with: #map:forest(20,20) and see what happens! 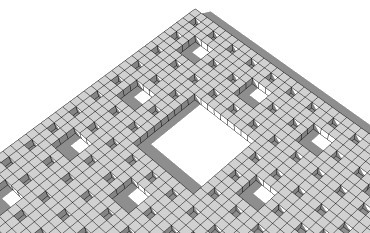 Generate an infinite amount of dungeon worlds. 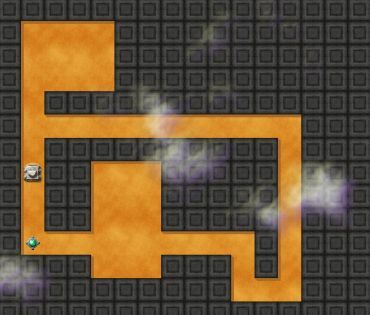 Start you script with: #map:dungeon(20,20) and see what happens! Generate an infinite amount of island worlds. 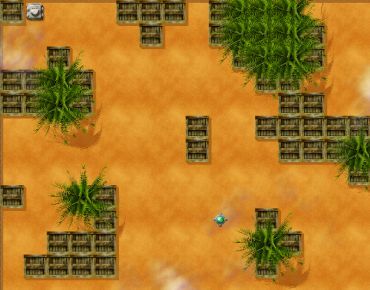 Start you script with: #map:islands(20,20) and see what happens! Generate an infinite amount of cave worlds. 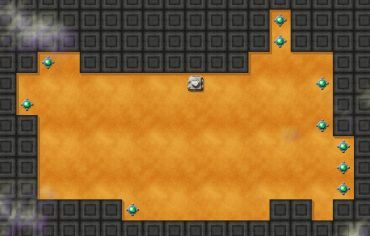 Start you script with: #map:cave(20,20) and see what happens! RoboMind is now only free to use for 30 days, by creating a free RoboMind Academy account. Prices are listed at the download page. Did your script become a bit messy? Simply press [Ctrl]+[Shift]+F to format the code automatically! You can also use [Ctrl]+[Alt]+F if you like to have your code blocks start on a new line. This version includes some bug fixes. RoboMind is now available in Italian, thanks to Nicola Esposito. RoboMind is now available in Bulgarian, thanks to Anton Ouzounov. RoboMind is now available in Slovenian, thanks to Miha Kočar. and Hervé Briard, Michel Drolet-Gravel for the French improvements! 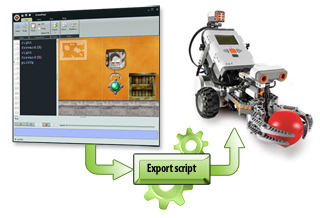 Now you can not only quickly test and evaluate your script in a simulation, but also let your creation work in the real world on LEGO NXT robots with a push of a button. By selecting the new Lego Skin, you can program in style. 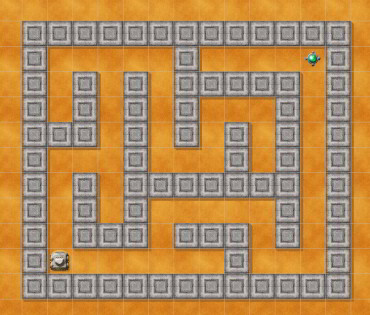 #map:maze(10,6) and see what happens! Similarly use #map:area(20,12) to create big empty spaces. Show statistics on how many instructions Robo performed to solve a task (View > Show stats). Print scripts directly from RoboMind. 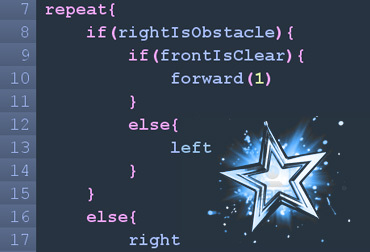 Code completion also works for programming structures and pop-ups the insert menu when anything is possible. So try out [Ctrl]+[Space] more often to reduce typing! Get rid of beacons entirely by eating them up. Give eatUp a try! A new concise search bar improves quickly browsing your code in style. When you start to run a correct script, shortly a balloon is shown to animate that Robo is storing your script in his Mind. Many small improvements have been made to make the graphical interface more user friendly. The RoboMind license changed from this version on. Unfortunately it is no longer open source since it seemed impossible to fund further development without introducing a more commercial license. The full version of RoboMind stays free for home use. However, schools and commercial users now need to buy a license. RoboMind can run much faster. This can be very useful when you want to make your robot do a lot of work! Insert your code faster by starting to type the command and then press Ctrl + Space. Select the desired command from the pop-up and press Enter. Make the script larger by holding Control and scroll the mouse wheel. Especially useful for digital school boards. 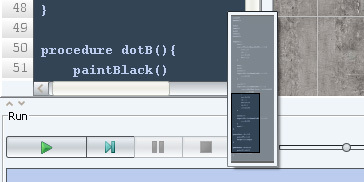 Quickly place a selected text block in a comment by placing # in front of lines, by pressing Ctrl + /. Selected code can be uncommented with Ctrl + Shift + /. RoboMind is now available in Indonesian thanks to Mizwar Fahri Doni and also in Catalan, thanks to Roger Rué. more flexible maps allowing big images. close pop-up windows with the Escape key. RoboMind is now available in Slovak thanks to Matúš Pálfi and Zuzana Tkáčová. Ukrainian, thanks to Grygorij Gromko. Improved copy/paste behavior of source code among different applications. Scripts, maps and preferences are now stored in the user profile for easier installation in networks. With syntax highlighting different parts of the script are marked with their own color, making a script more readable. Greek, thanks to Panos Eracleous. The software now runs with the latest internal libraries with improved speed and reliablity. The interface now has an up-to-date Ribbon menu. Tip: Double-click a tab to minimize the menu bar. Tip: In case you are too attached to the old menu bar, look at Settings > View. The entire development environment became free and open source. The source is available in the download section. Read the license for more details. RoboMind is now available in German and Portuguese, thanks to Marcel Kirsch and Fabiane Barreto Vavassori Benitti. RoboMind now understands Chinese and Swedish, thanks to Bodechang and Adam Troy. A script can now open the apropraite map automatically. 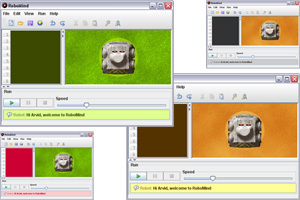 Several elements of the application are improved, so RoboMind has become more robust. Some major features are added in RoboMind 2.0 that will make experimenting even easier. To better keep track of what instruction is executed in difficult parts of the code it is possible to go through the code step by step. The robot can now execute the commands north(n), south(n), east(n), west(n) to navigate more easily in the environment in certain situations. 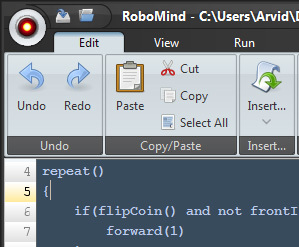 Also the robot can perform random behaviour with the new command flipCoin(). Basic instructions and controle structures can be inserted in the script from the menu. This saves typework, but is above all a quick reference of the syntax. The script language will be detected automatically before trying to execute a program. It becomes easier to try script found on the internet in another language. This new version also comes with an automatic script translator. RoboMind has a brand new look with some cool features! You're able to choose new designs for the monitor and tweak the text areas to your own likings. The radar gives you an overview of the whole environment. At the core of RoboMind you will find a new Java Runtime. This results in smoother animations and a better response to the user interface. RoboMind is ready for to conquer the world, because it now supports English. You can define both the language of the user interface, as the programming language. You can now zoom quicker and the range is limited to prevent extreme values. RoboMind becomes available to everybody for the very first time.